Tudor has a knack for taking the spotlight at Baselworld. Over the last few years, the news cycle seems to always start with Tudor — perhaps through a “leaked” teaser or a pre-Basel party on the eve of the show — and then it comes back to Tudor when blogs, such as yours truly, publish wrap-ups, round-ups and best-ofs for the event. 2018 was no different — in fact, it may have been Tudor’s strongest year yet. The first wave of news to hit was that Tudor had launched a GMT Black Bay (read our review here). It was a logical next step for the brand and the Black Bay line. And then came the second wave. The rumors sounded wrong at first — almost like they were too good to be true. Could Tudor really have released a 39-millimeter Black Bay with a bezel? Sure, they had already done smaller, non-bezel varieties, but to make a smaller, bezeled Black Bay seemed unlikely. I mean, at that point wouldn’t it be nearly at vintage Submariner proportions? And if they did make it, then what movement would they use? Surely not an in-house movement, I thought. 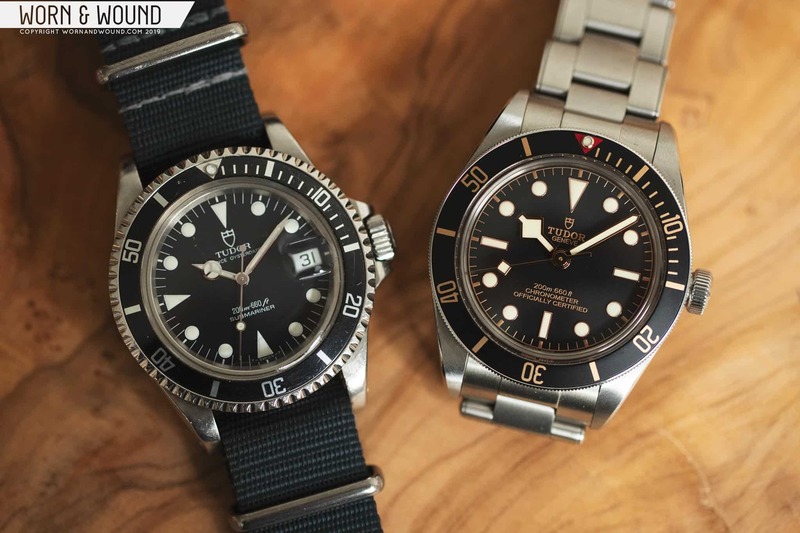 After all, the original Black Bay and Pelagos actually got a touch thicker when they made that switch from ETA to in-house, suggesting that Tudor’s movements are fairly sizable. I concluded that the rumors were wrong. And then, much to my pleasant surprise, I was the wrong one. The new watch, dubbed the Black Bay Fifty-Eight, was very much real, and it was really just 39 millimeters in diameter with a new, smaller, in-house caliber. It also came with a more consumer-friendly price tag, costing about $100 less than its older, larger siblings. While the diameter only shrunk 2 millimeters, the rest of the defining dimensions came down proportionally as well. The lugs went from 22 to 20 millimeters, and the the lug-to-lug went from 50 to 47.75 millimeters, and, perhaps most importantly, the thickness dropped from 14.8 to 11.9 millimeters. The end result is a watch that wears entirely differently and looks more like its vintage forefathers, thus opening the Black Bay line up to an even broader group of enthusiasts and customers. Of course, you’re reading this in 2019, and this is all old news already. Today, slightly under a year since it was unveiled, but only a few months after it first hit shelves, we’re giving the watch a proper review. Is this the Black Bay of our dreams? Is it the everyman’s and woman’s Submariner? A Sub for a new age and a new generation? Can this help us get over our collective disappointment at having not bought a vintage Tudor Sub back when they were more reasonably priced? Let’s find out. The Black Bay Fifty-Eight (I’ll call it the BB58 going forward for brevity’s sake) just looks right on and off the wrist. It’s smaller, but it’s not small, and it retains all of the stylish, sporty charm that Black Bays (and Submariners for that matter) are known for having. Measuring 39 x 47.75 x 11.9 millimeters, the case hits a sweet spot for a compact sport/dive watch. We’ve been seeing more and more 39-millimeter watches, and it’s a size that seems to work well for watches with and without bezels. That’s even more true when there is a larger option for those of us who prefer a beefier watch with more presence, as is the case here. As I wrote above, it’s less the diameter that matters here, and it’s more about the overall proportions of the watch. It’s not as long lug-to-lug, so the case centers better on a smaller wrist. The diameter here is brought in, but the dial-to-bezel proportions have been tweaked (as far as I can tell) by increasing the relative size of the dial opening. This allows the watch to get smaller without looking much smaller. But the real story here, and it’s what makes the biggest difference, is the thickness. Coming in at a hair under 12 millimeters, the case thickness is ideal for a diver. It’s not going to win any awards for being the thinnest dive watch, but it’s not trying to. It’s still a tool watch with a rugged charm, but it’s no longer clunky. Moreover, it looks thin because the mid-case here is not a block of polished steel. The overall thickness is broken up more evenly among the case-back, mid-case, bezel, and crystal. Tudor attempted to address this with the BB41 GMT by adding a new bevel along the bottom of the case, which helped a bit. But the truest fix to this problem is a thinner case, and the BB58 does it right. As for the design, if you’ve seen a Black Bay before, then you shouldn’t have any surprises. It retains the same curves, shape, finishing, etc. The brushing on the top of the lugs is still exceptional, as is the sharp bevel that cuts around the edge of the case. The sides are still polished, which is in keeping with the Sub-design language. However, given the amount of deviation the Black Bay has from vintage models, I’d love to see a brushed version at some point. The bezel still looks very nice, but it’s still a bit slippery since there is no overhang like on the Pelagos. That said, the 60-click mechanism feels spot-on when turning, and it still has that cool little locking mechanism at 0/60 where it takes a bit more effort to turn at that spot. The crown is still “big” relative to the case, but it doesn’t feel as exaggerated. It’s signed with a large Tudor Rose logo, same as on the BB41, and it is a visually appealing nod to vintage Tudor. One thing it’s lacking, however, is the colored crown tube. This was sort of a signature of the Black Bay, but one that was always met with a lukewarm response. It didn’t ruin anything, but it didn’t really add anything to the watch either. I never hated it, but I also don’t miss it on the BB58. Even more than the case, the dial of the BB58 is pure Black Bay. Tudor has a formula, and they don’t stray from it here. In fact, it’s basically a slightly scaled down version of the Black Bay Black dial I reviewed a couple of years ago (read that review here). The dial surface is matte black and looks a touch faded to my eyes. Tudor says the dial is domed, so I assume it’s domed, but the effect is very subtle. Perhaps there is a touch of curvature to be seen at the edge of the dial and I’m just missing it. On the surface, you have the telltale Submariner-style hour markers composed of lume-filled, rose gold appliqués. The lume is also that same warm custard color that is just far enough off-white to not look too new, but without looking like faux-patina. Around the edge of the dial is a closed index of hash marks for the minutes/seconds rendered in a faux-rose gold print. In the center, you have the logo under 12 and the depth rating plus chronometer text above 6. The hands are the staple “snowflake” set finished in polished rose gold. Frankly, the only difference I can see here from the BB41 is that the dial printing might get a touch closer to the edge, as indicated by the more obscured “Swiss Made” text under 6. Though I once took issue with the snowflake hour hand being mixed with round markers, after a few years of seeing Black Bays around, I just don’t care anymore. I still think the handset looks better with square markers (à la the Pelagos), but I’ve gotten used to it as is. It’s not actually offensive and, given the success of the line, it’s becoming its own thing. You win, Tudor. On the BB58, the hands look great and do their job of helping you tell the time quickly. While the dial remains roughly the same, the bezel has a slight cosmetic change that makes this first version of the BB58 unique in the collection. 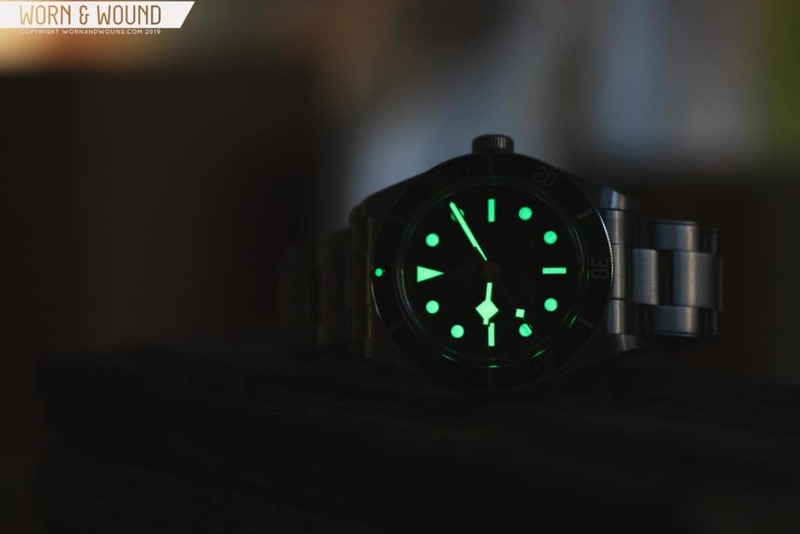 The insert is black, anodized aluminum and features a red triangle at 0/60 with a lume pearl, just like it does on the BB41 Black. But instead of raw aluminum for the numerals and markings, Tudor went with rose gold to match the dial inserts. The result is a decent amount more gold being added to the picture, but not too much. It basically falls somewhere in between the Black Bay Black and Tudor’s two-tone models. Think of this one as two-tone light. While I’ve seen some disagreement about this move, and even in the W&W office not everyone is on the same page, but I think it’s great. I’ve come to really like gold/gilt accents on sport watches. I’m not about to go full gold any time soon, but I do enjoy a touch of that warm tone coming off a watch. It makes a watch feel less starkly modern while not specifically going for a vintage twist. On the BB58, it makes the gold accents of the dial jump out a bit more, and the overall package more style than sport focused. As the inaugural BB58, this also makes it feel more special. The story of the BB58 doesn’t stop with the smaller case, which is really a gateway to something more significant. The BB58 is powered by a whole new caliber, the MT5402. Featuring the same technical specs as its bigger, older brother (the MT5602 featured in the BB41s), the MT5402 is a COSC-certified chronometer with a 70-hour power reserve, silicon hairspring, free-sprung balance, 27 jewels, a frequency of 28,800 bph, and a bidirectional winding rotor. The difference is simply the size. But this isn’t the case of just a smaller base plate; it’s really a whole new movement, now measuring 26 x 4.99 millimeters against the 31.8 x 6.5 millimeters of the older caliber. That’s a huge difference and it’s what allows Tudor to get away with the smaller, thinner case. For reference, the ETA 2824-2 is 25.6 x 4.6 millimeters, so the new movement is much more in line with that industry staple. In my time with the BB58, it was extremely accurate and showed no power reserve issues. In fact, I was delighted to find it still ticking and right on time after a couple of days of not wearing it. On a timegrapher, the results were phenomenal. Given that my usage of that tool is amateur at best, I won’t publish the results, but let’s just say they were well within spec. I think you can’t really underestimate what a big move the BB58 is for Tudor. It’s not just a great watch that satisfies a deep yearning for a more vintage-feeling, Submariner-inspired watch by the house with actual rights to the name (Hans Wildorf Group), it’s a whole new platform for the brand. This isn’t going to be a one-and-done situation. Not only did they invest in the tooling for all of the case, dial, and bracelet components for the watch, but they did so for the movement as well. And the former doesn’t even compare to the significance of the latter. This movement is likely to wipe out what’s left of ETA from the brand, which not only makes them independent from Swatch group, but now solidifies Tudor as the $3,000 – $5,000 powerhouse they want to be. To paraphrase Walter White, they are in the empire business. The rivet bracelet that Tudor introduced to the Black Bay line in 2016 really completed the throwback image of the watch, so I was glad to see that they launched the BB58 with a 20-millimeter version. While there are leather and fabric options for the watch, the bracelet is the right choice. As for the details, it’s exactly what you expect. The bracelet is 20 millimeters at the lugs, and it tapers down in steps to 16 millimeters. Every link features rivet-plated sides, with the removable links dropping one rivet for a screw-bar. It’s a smart detail because it both looks good and allows for easy sizing at home. The clasp is a solid, well-finished, fold-over clasp with a secondary lock that creates a Tudor Shield shape. And now for the most important part — how it wears. Does the difference in size make that big of a difference on the wrist? The answer is an unabashed yes. The new case makes a world of difference. The BB58 is svelte and compact, but still toolish and masculine. None of the ruggedness of the BB41 has been lost, and the vintage charm has only been amplified. And the watch is just straight-up comfortable. There’s no snagging on my sleeve, no fatigue by the end of the day, no awkward pressing while sitting at my desk and typing. It’s exactly as I want it to be. Granted, I prefer smaller, thinner watches in general. As my wrist teeters around 7 inches and isn’t broad, I find shorter lug-to-lug lengths and diameters from 36 – 40 millimeters ideal. That said, looking back at photos of the BB41 on my wrist, I can’t say that that watch looked bad. Bigger, perhaps a touch bolder, but not oversized. The BB58 is more about its subtle proportions. It’s not pushing my limits. It sits centered on my wrist, which allows for more of the bracelet to be visible from above. Ultimately, it’s really just a matter of preference, and Tudor now has good options for different tastes. Of course, the other factor is vintage-ness. 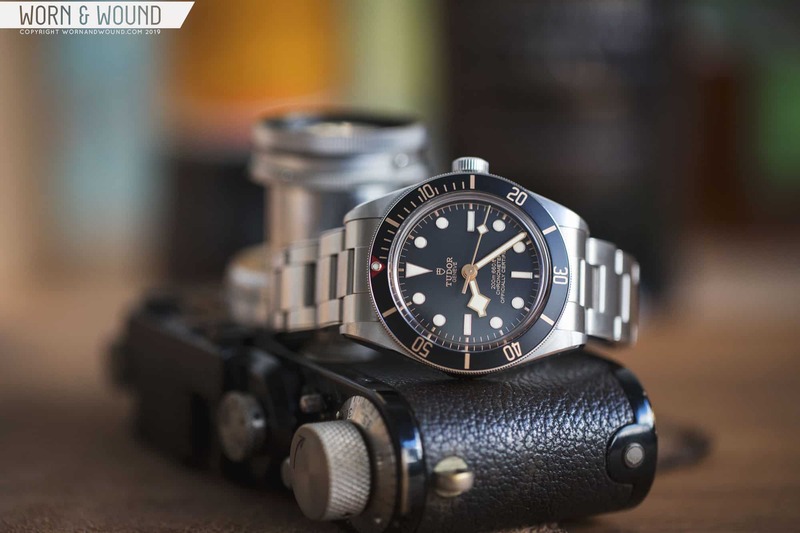 The Black Bay is part of Tudors heritage line so it’s meant to speak to vintage Tudor Submariners, and Tudor has built its success largely off of the rising popularity of vintage watches in general. The BB41 had the looks, but not the scale. 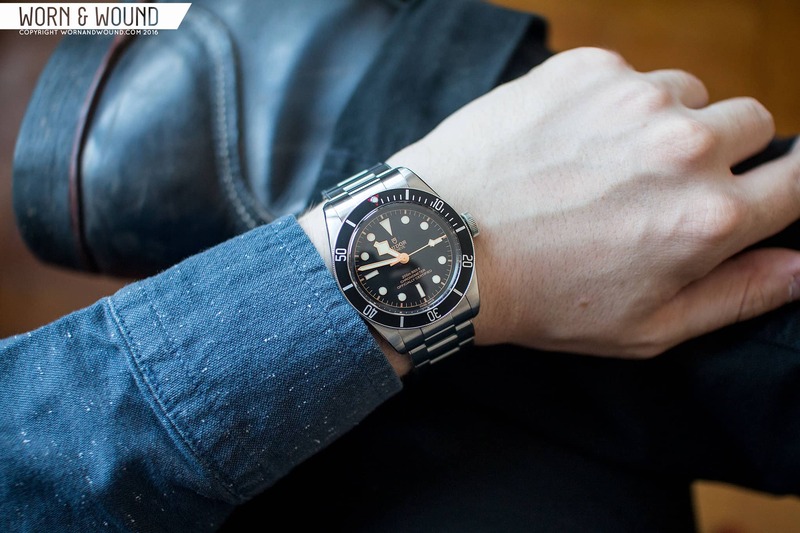 The BB58 looks and feels like a vintage Submariner. As vintage prices continue to go up, the BB58 provides a great alternative — and not just in terms of aesthetics. It’s arguably the smarter purchase given the modern build and specs. It’s not often that a brand takes something great and makes it even better, but that’s exactly what Tudor did with the BB58. The Black Bay format was already proven and wildly successful. While newer variations of the BB41 debuted with perhaps less fanfare than early versions did (likely a sign of slight fatigue or too many options), the Black Bay was nevertheless on track to become an iconic watch in its own right. With the BB58, Tudor dropped the mic. They took all of the criticizable elements of the BB41, fixed them, and added a whole new in-house caliber into the mix. With both sizes being available (and technically there’s one larger variant in the form of the 43-millimeter bronze case, not to mention the bezel-less models) they have everyone covered now. And that means everyone has to buy one! I’m kidding, of course, but Tudor is certainly making it harder to resist, especially since Tudor also dropped the price on the BB58 by $100 dollars (compared to the BB41) to $3,575. And that’s not even taking into consideration the price for pre-owned models, which will be even more tempting. Perhaps the price difference accounts for the cost of saved steel, but it’s more likely a strategic choice to be even more competitive. Tudor really is trying to own the $3,000 – $5,000 space, and the fact that their most popular watch is closer to $3,000 than $5,000 while sporting an in-house caliber is very smart. We’ve already seen the industry react with the likes of Omega, IWC, Panerai, and Baume and Mercier offering in-house models under $5,000. The post Review: Tudor Black Bay Fifty-Eight appeared first on Worn & Wound.